The correct time to temper steel for a knife is after the blade has been formed and shaped but before the final assembly and polishing. Tempering at higher temperatures results in a softer blade that will be more durable and less likely to snap off, but will not hold an edge as well. Tempering at lower temperatures yields a harder knife that will stay sharp longer, but it will also be more brittle. Decide how the knife will be used. Knives that will see a lot of abuse need to reach higher temperatures to ensure that the blade will be flexible enough to avoid snapping during heavy use. This includes skinning, hunting, and carving knives, where edge retention is paramount. Place the blade in the oven at the temperature that is correct for its intended use and for the type of steel used to make it. 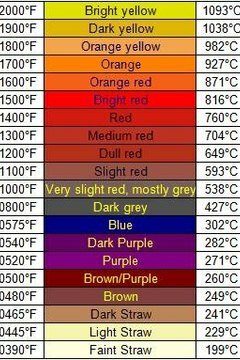 This is usually 550 degrees Fahrenheit for skinners, tactical knives, and meat carvers. Observe the knife blade color between tempering cycles. A harder knife will be straw color to brown, mid-range would peacock to purple, and dark blue would be used for the softest blades. There is a point of diminishing returns, however. If the blade color goes past dark blue, the knife will begin losing temper and become soft. The steel will need to be rehardened before you can continue. Heat the blade at the desired temperature for one hour, and then allow it to cool to room temperature. Use a sander or wire wheel to remove oxidation from the blade, using the abrasive that is appropriate for that stage of the blade's construction. According to Elliot Rehm, a 10-year veteran blade maker, "Use the same abrasive between each tempering cycle as the one for the current step of the knife-making process. For example, if you just finished grinding the blade profile using 80-grit abrasive, use 80-grit abrasive between tempering cycles. Sand just enough to clean away any oxidation caused by the tempering cycle, so that you can see the color the steel will reach in the next cycle." Give the blade a final sanding after the third tempering cycle, then finish assembling the knife and making the handle. This article assumes that the steel you are using to make the knife blade has already been hardened. It also assumes that the reader is an experienced knife maker who understands basic metalworking terms and processes. Use heavy work gloves when working with hot steel. Do not temper non-ferrous metals or alloys in the kitchen. Alloys can produce noxious fumes which can cause lung damage, breathing difficulties and death. How do I Mill Aluminum With a Drill Press? Smith, Jane. "How to Temper Knife Blades." , https://careertrend.com/how-4897436-temper-knife-blades.html. 27 December 2018.